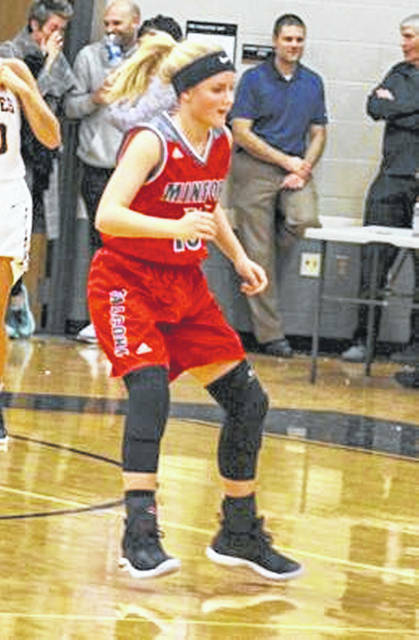 Minford has four players reach double-digit scoring figures Wednesday night, including Livi Shonkwiler with a game-high 23 points. MINFORD — When Livi Shonkwiler believes in Livi Shonkwiler, good things happen. That’s the scouting report on Minford’s sophomore guard … one she must’ve read herself before suiting up against Portsmouth West. So with a shot of confidence, Shonkwiler habitually sliced and diced her way to the basket Wednesday en route to a game-high 23 points, in a 74-52 victory over the Senators in Southern Ohio Conference II action. But she was quick to cast any sort of credit for her big night onto teammate Maddie Slusher. While Slusher certainly had herself a night, Shonkwiler had to hit her open shots. And even though she doesn’t want to take credit, Minford coach Shane Davis gave it to her anyways. And he didn’t forget about Slusher who, as Shonkwiler mentioned, enjoyed success on both ends of the floor. The junior finished with 11 points, seven rebounds and seven assists. While Shonkwiler and Slusher certainly led Minford (1-1, 1-1 SOC II) in a broad sense, they also had all the help they’d ever want or need. Four Falcons reached double-digit scoring figures including Ashley Blankenship and Makenzie Watters. But Davis doesn’t care who scores as long as Minford comes out on top. After a season-opening loss to Wheelersburg, Wednesday’s win was a big momentum builder heading into Thursdays’ contest against Oak Hill. The fact that the Falcons played as a team and showed significant signs of improvement in such a short period of time speaks volumes. But yes, there are still things to work on. The Senators (2-1, 1-1 SOC II) took an early 4-0 lead, only to see the Falcons rip off a 13-2 run, taking a 13-6 lead; one they’d never relinquish. By halftime, Minford had built a 35-22 edge. But out of the break, West twice found guard Jordyn Swords wide open in the corner. When Swords proceeded to knock down back-to-back 3’s, all of the sudden, the lead had been cut to six at 35-28. Once that happened, Davis’ Falcons dug back in and went on a 19-7 run to break things wide open at 54-35. Then, they sat back in the driver’s seat and switched into cruise control. Following Shonkwiler and Slusher’s efforts was junior Makenzie Watters with 12 point and eight rebounds, followed by Ashley Blankenship with 13 points. Hannah Tolle also helped out, scoring eight points and grabbing a game-high 11 boards. Sword led the Senators with 18 points while Emily Sissel added 11 and five rebounds. Freshman Eden Cline was also a factor, coming off the bench to score 11 points of her own. The Falcons get back into SOC II play Thursday evening, hosting Oak Hill while West follows suit, trying to bounce back against South Webster. Portsmouth West: 18-43 FG, 9-15 FT, 7-14 3pt. (Cline 3), 23 rebounds (Rigsby 8), 23 turnovers, 9 assists (Adkins 6). Scoring: Swords 18, Cline 11, Sissel 11, Pack 7, Adkins 5. Minford: 30-67 FG, 9-16 FT, 5-21 3pt. (Slusher 2), 37 rebounds (Tolle 11), 16 turnovers, 15 assists (Slusher 7). Scoring: Shonkwiler 23, Blankenship 13, Watters 12, Slusher 11, Tolle 8, Thacker 4, Wolfenbarker 3.